Renault 5 GT Turbo replacement new set of four Wossner forged pistons. 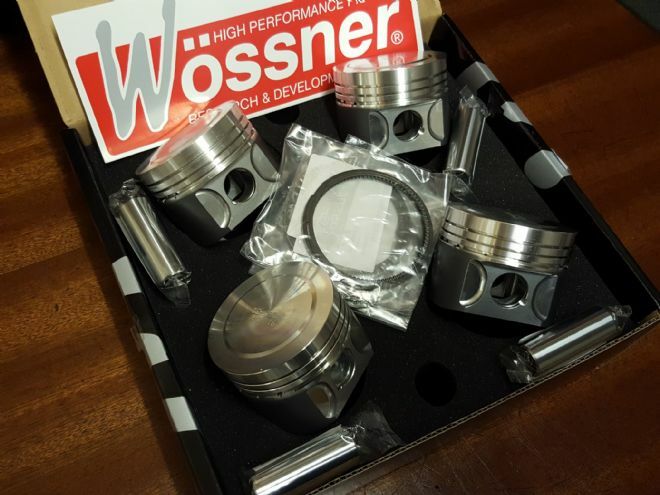 Wössner pistons feature a unique Moly coating on the skirts and a grade of 4032 Alloy (T6) which allows the engine to run a closer piston to bore tolerance then he might do on another make of piston. This helps remove the slapping noise during cold start, common place among engines running forged pistons due to larger then OE bore clearances. The crowns of the pistons are mirror polished to better resist detonation on a high performance engine. Mirror polishing allows a more even spread of heat inside the chamber which will help prevent “hot spots” on piston crowns. Includes all piston rings and gudgeon pins.